Respected author, professor, and psychologist Gary W. Moon thinks it has to do with our hyper-intellectual but non-experiential method of living the Christian life. In this winsome book Moon provides a thirty-day apprenticeship with Jesus, whereby readers will actively practice being with Jesus day in and day out. Each day's reading uses compelling stories and scripture to illustrate a point and closes with a suggested apprenticeship activity. Gary W. Moon (MDiv, PhD) is Vice President and Chair of Integration at Richmont Graduate University in Atlanta, Georgia. He also serves as the Executive Director of the Renovar&eacute; International Institute for Christian Spiritual Formation. His most recent books include Falling for God and Spiritual Direction and the Care of Souls. 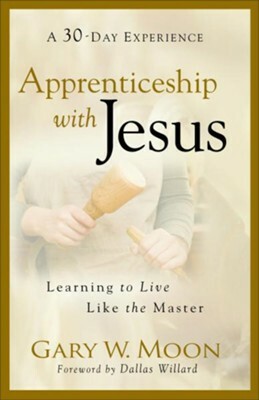 I'm the author/artist and I want to review Apprenticeship with Jesus: Learning to Live Like the Master - eBook.